The big noise (pardon the pun) in compact cameras at the moment is high ISO, which in plain English means the ability to avoid using flash in low-light settings. Nikon's boxy but stylish S500 is another high-ISO shooter, going up to ISO 2,000 while squeezing 7.1 megapixels onto a compact camera sensor. First impressions are positive. This is one of the few stainless steel cameras at this price and the build quality really stands out, so it will instantly appeal to families looking for a sturdy, easy-to-use snapper. The camera is simple to operate, though the click wheel is quite loose and can accidentally activate menus if you forget to turn the camera off before putting it in a pocket. Vibration reduction is built-in and, while useful, it would have been more productive for Nikon to concentrate on noise reduction. Whack the ISO up to take flash-free shots and the digital grain and muddy colours are very noticeable. We're not sure how bothered the target market will be by this drop in quality, but we find that Nikon's compacts tend to be noisier than similarly specced cameras from Fujfilm. Below ISO 600, the camera takes perfectly good shots for a point-and-click model, and benefits from a quality Nikkor lens (maximum aperture range is f/2.8 to f/4.7, with 3x optical zoom). In keeping with its simple interface, an optical viewfinder is forgotten in favour of a generous 2.5-inch LCD. It's clear enough but composition gets harder in bright sunlight. A bigger problem is the comparatively slow shutter speed. 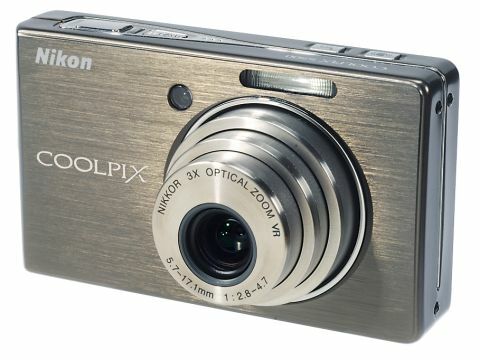 For £158 this camera is a reasonable buy, but the ISO 2,000 rating and vibration reduction aren't big enough selling points to make you buy this over the Nikon Coolpix L11, which is £50 cheaper. This isn't bad, but 'not bad' isn't good enough in today's competitive, sub-£200 compact market.